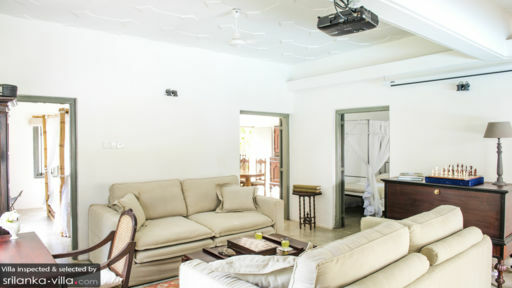 The Cottage Bentota is a self-contained, modern home in the resort town of Bentota, Sri Lanka. The coastal town is renowned for its lazy, laid-back vibe, Bentota beach that extends out to meet Paradise Island, and the home of renowned architect Geoffrey Bawa. The home is a three-bedroom property with wide open spaces, lush gardens, and a private swimming pool. It is best suited for a group of friends or a family of six with modern comforts such as a home theatre, garden BBQ, and air-conditioned bedrooms. The three bedrooms at The Cottage Bentota can accommodate six guests including children and you have the option of a baby cot, if needed. All the rooms are air-conditioned and the master bedroom is the king suite. The master bedroom has been furnished with a beautiful, rustic four-poster bed with bamboo posters. It has a comfy slingback chair and a lattice-work storage unit. You have access to an ensuite bathroom and garden views. The remaining two bedrooms are found across the garden and they are furnished with a queen bed and two singles. The bedrooms share a bathroom making this ideal for a family of four. 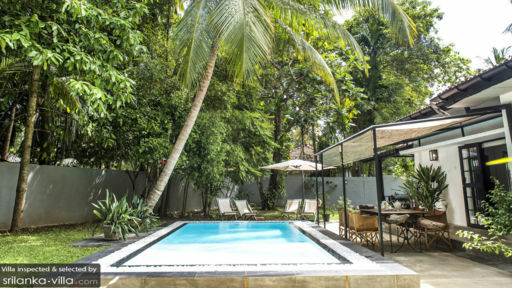 At The Cottage Bentota, guests can enjoy themselves to the fullest as they can easily access the open, well-kept gardens that feature a myriad of native plants and trees. The swimming pool resides in the middle of this natural luxury and you can enjoy the same either by swimming laps or resting on the sunbeds. The rustic outdoors is made complete with a safari-like alfresco dining area set up just beside the pool. Enjoy a garden BBQ with fresh grilled food while lounging on the canvas chairs under the open skies. The villa is a luxurious property that does not compromise on style or comfort. It has pristine white interiors accented by hand-crafted wooden furniture. The space is essentially modern with a minimalist aesthetic to highlight its natural surroundings. You have a lavish living area all to yourself since the villa is self-serviced. The room has been decorated with more than one antique wooden piece including the book cabinet and the trunk-style coffee table. The plush sofas are a calming beige and you can kick back and relax with a glass of wine and some music or play a game of chess. There is a home cinema available as well with a projector screen to keep your entertained. There is a study desk as well where you can do some work which even has a printer. The dining area indoors is also a great place to enjoy a meal you prepare by yourself in the fully-equipped kitchen. The kitchen has a Nespresso machine so you can grab a coffee and start your day. The amenities offered at The Cottage Bentota include daily chores such as housekeeping, guest assistance, and maintenance of the pool/garden. The management can provide the services of a skilled private chef as per your request. You can rent out a boat or a scooter to go around the town. 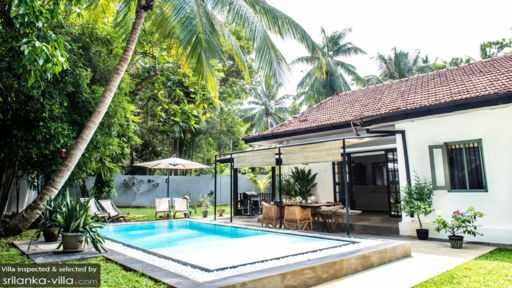 The villa is located in Bentota, which is home to several resorts and beachside villas. It is home to thriving coral reefs, ancient temples and the cinnamon estate of Lunuganga, home to Geoffrey Bawa. Another must-see spot in the region has to be Brief Garden, Bevis Bawa’s home. Some restaurants you can visit include Randholee for local Sri Lankan food. You can even take a cruise on the river with Bentota River Boat Cruise.